Paul Black recently attended the Serpentine Sackler Gallery, which is currently presenting the first major exhibition of work by Kerstin Brätsch and Adele Röder in a UK public gallery. The artists are based in New York and London – and as well as their individual practices – Brätsch and Röder have worked collaboratively as DAS INSTITUT since 2007, and are presenting both individual and collaborative works at the Serpentine Sackler. Both artists form a strong installational relationship with the Sackler space. The show is an intuitive one, where the combination of practices claims an attempt to communicate the inexpressible – that aside – both Brätsch and Röder achieve an inclusivity via humour, pulling the viewer beyond some of the works more surrealist elements as with the video work ‘Am Sonntag (from “When You See Me Again It Wont Be Me” Series)’ where Surrealist performative relationships give way to comedy – as it does with the neon work ‘Comcoröder (Breast) 2010-2015’, which greets the viewer upon entering the gallery with a degree of Emin-esque insolence. Image: DAS INSTITUT; Installation view, Serpentine Sackler Gallery, London. Photo: P A Black © Artlyst 2016. 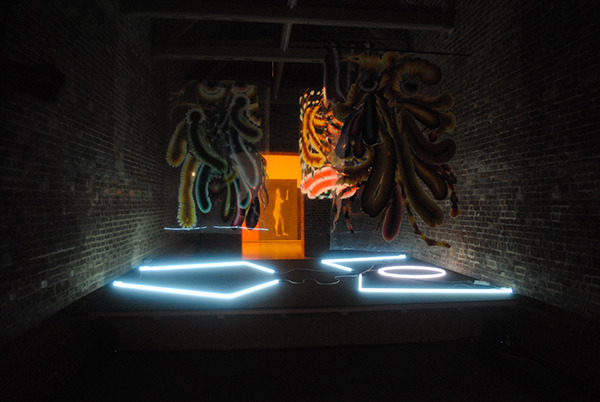 Here the artists practices become layered and convergent, forming a more installational dialectic disparate to the languages of the individual works – and due to this, the installational becomes the singular aesthetic – one that could be argued is the show’s primary concern, or a concern that at least becomes so via the juxtaposition of Röder and Brätsch’s distinctive singular practices. 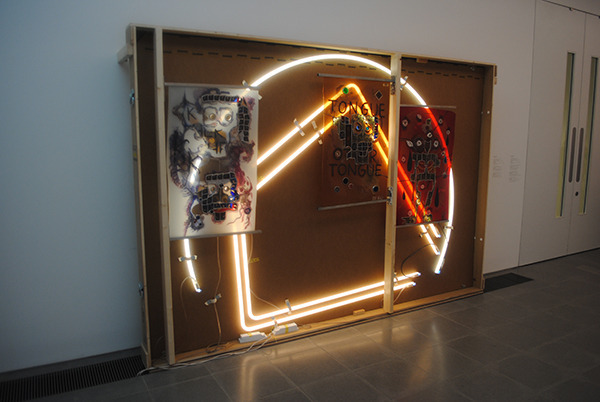 Röder’s particular assemblages of neon and wooden structures eschew the purity of Dan Flavin in favour of symbolism, exploring non-verbal languages that form particularly accessible works, referencing everything from basic language forms, totems, glyphs, and signage, and sometimes with a slight Basquiat-esque flourish of skull-like primitivism. The transformative qualities of the body are also mutual references in both Brätsch and Röder’s works, with Brätsch’s psychedelic figurative paintings somewhere between Chris Ofili and tie-dye, and reminiscent of some kind of early exploration of Auras. Image: DAS INSTITUT; First, Second, Third, And Fourth Tabernacle, Serpentine Sackler Gallery, London. Photo: P A Black © Artlyst 2016. Traces of Brätsch and Röder’s own physicality are made visible via performative interaction, silhouettes, the actions of a mark reflecting the ever-present body, symbols and glyphs reflecting the tools invented and present to form an act of communication between two bodies – in this instance the artists themselves – while creating a dialectic between artist, work, and viewer. This exhibition is concerned with art as communication – while communicating an exploration of communication. What seems ironic in hindsight is that sound as a form of communication is largely absent as a medium. DAS INSTITUT was created in 2007 by Kerstin Brätsch (born in 1979 in Hamburg, Germany) and Adele Röder (born in 1980 in Dresden, Germany), who live and work between New York and London. Recent DAS INSTITUT exhibitions include Kollision, Künstlerhaus Bethanien Berlin (2016); Made in Germany: Contemporary Art from the Rubell Family Collection, The McNay Art Museum, San Antonio (2015); Off Cardinal Points, (with Allison Katz), Krauper-Tuskany Zeider, Berlin (2015); Dredgers on the Rail, (with Allison Katz), Freedman Fitzpatrick, Los Angeles (2015); Triennial of Contemporary Prints, Musee de Beaux Arts, Le Loce (2015); Future Perfect, IFA at Memorial do RS, Porto Alegre (2014). Lead image: ￼￼￼￼￼￼￼￼￼￼￼￼￼￼￼￼￼￼￼￼￼￼￼￼￼￼￼￼￼￼￼￼￼￼￼￼￼￼￼￼￼￼￼￼￼￼￼￼￼￼￼￼￼￼￼￼￼￼￼￼￼￼￼￼￼￼￼￼￼￼￼￼￼￼￼￼￼￼￼￼￼￼￼￼￼￼￼￼￼￼￼￼￼￼￼￼￼￼￼￼￼￼￼￼￼￼￼￼￼￼￼￼￼￼￼￼￼￼￼￼￼￼￼￼￼￼￼￼￼￼￼￼￼DAS INSTITUT, Comcoröder (Breast) 2010-2015, Serpentine Sackler Gallery, London. Photo: P A Black © Artlyst 2016. DAS INSTITUT – Serpentine Sackler Gallery – until 15 May 2016.